On Wednesday, HRH Crown Princess Mary awarded The Crown Princess Mary Scholarship to Avril Francis and Thomas Lynch. The two Australian exchange students have chosen to spend a semester studying at the University of Copenhagen. “When you decided to go on exchange, you were probably presented with a wide range of possible destinations around the world. In your scholarship application, however, you both emphasised the desire to study in Copenhagen. You wanted to improve your skills within environmental and urban planning and economics, where the University of Copenhagen has much to offer, and you wanted to gain a broader cultural understanding of Denmark and Danes," said HRH Crown Princess Mary in her speech to the two students, who Wednesday afternoon were awarded The Crown Princess Mary Scholarship at the University of Copenhagen. This year's scholarship recipients are Avril Jane Francis from Griffith University and Thomas Patrick Lynch from the University of Queensland. Rector Henrik C. Wegener speaking to the students and HRH Crown Princess Mary. Click on the image to enlarge. Avril Francis holds a bachelor degree in Environmental Engineering and is studying for a Master’s degree in Urban & Environmental Planning. In the 2015/16 academic year she was awarded the Griffith Award for Academic Excellence. In addition to her academic endeavours, Avril places great emphasis on voluntary work. She has, among other things, volunteered as an English and sports teacher for disadvantaged children in Cambodia. Thomas Lynch is working for a bachelor’s degree in economics. In addition to his academic work, Thomas is actively engaged in associations where he is involved in social and cultural events. For example, as Inter-College Counsel Cultural Conventor, he has worked with students of different professional and cultural backgrounds. 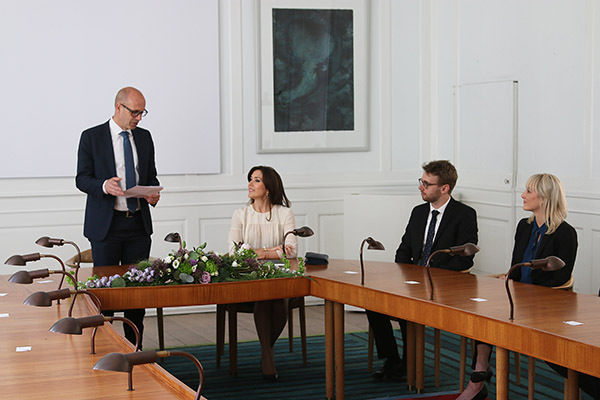 “I hope that you will benefit from your stay in Copenhagen, and that it will not only contribute to a more international mindset and broaden your academic skills but also that it will give you unforgettable experiences," said HRH Crown Princess Mary in her speech to the two recipients. 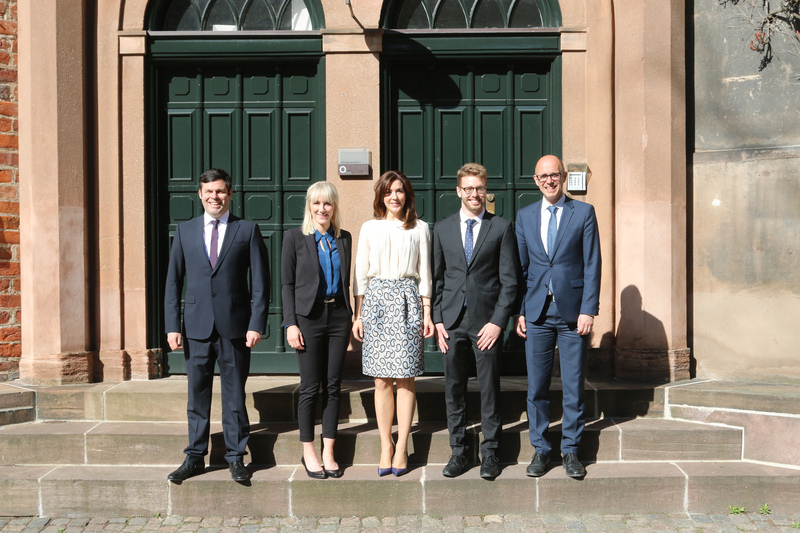 From left: Australia's ambassador Damien Miller, scholarship recipient Avril Francis, HRH Crown Princess Mary, scholarship recipient Thomas Lynch and Rector of the University of Copenhagen Henrik C. Wegener. Click on the image to enlarge. Each year, the University of Copenhagen receives around 2,000 applications from exchange students. Most of them come from the USA, Australia, Germany and Southern Europe. 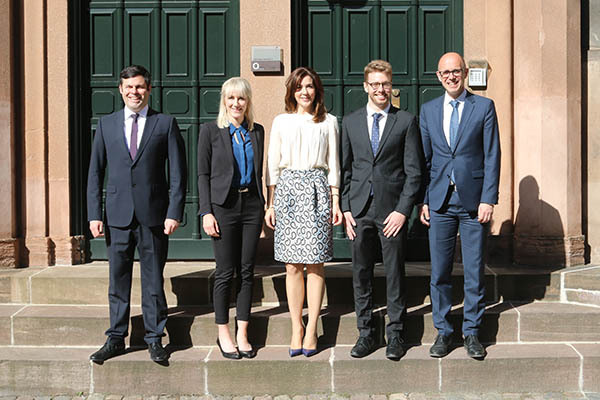 The Crown Princess Mary Scholarship is awarded this year for the 13th time. The award is part of the wedding gift the university gave the Crown Prince and Princess in 2004. Two scholarships of DKK 10,000 are awarded to exchange students from UCPH’s Australian partner universities. The scholarships are intended as financial help toward the students’ stay in Denmark. Each of the Australian partner universities is invited to nominate a student who is going on exchange at the University of Copenhagen. A scholarship committee then recommends two recipients to Prorector Lykke Friis, who makes the final approval.